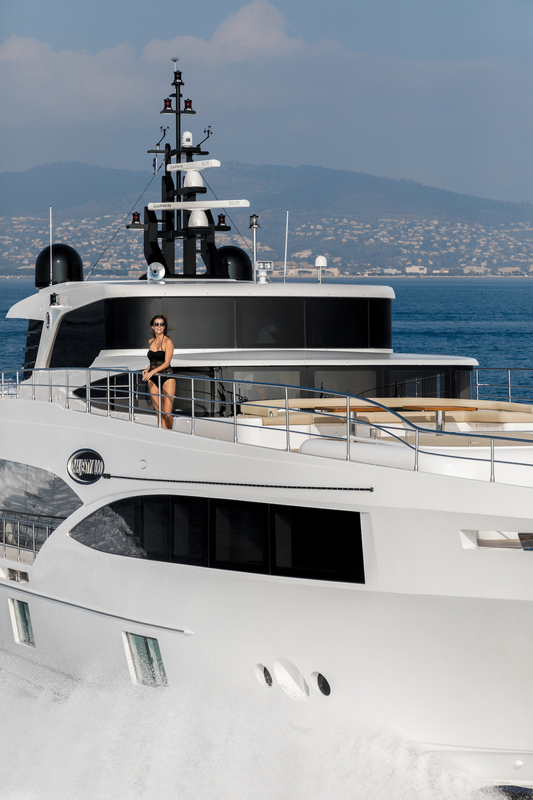 MIA is a striking MAJESTY 100 yacht measuring 31,70m (104’11’) built by the respected builder Gulf Craft and launched in 2017. 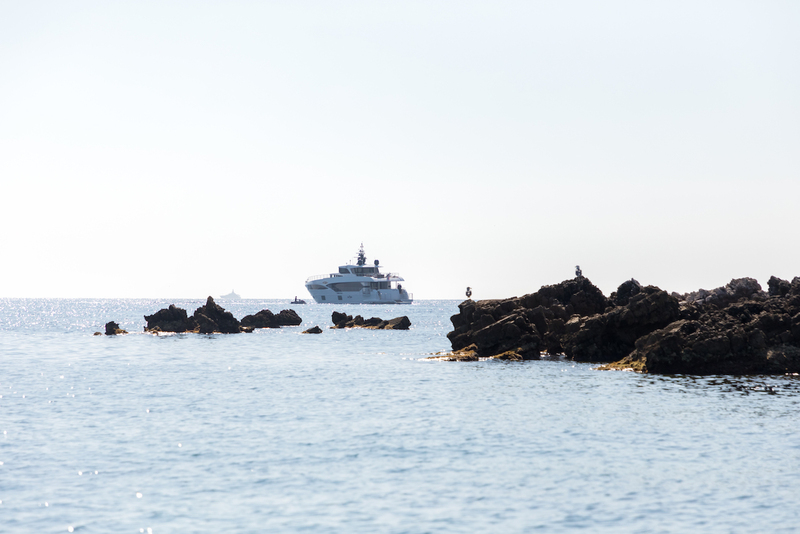 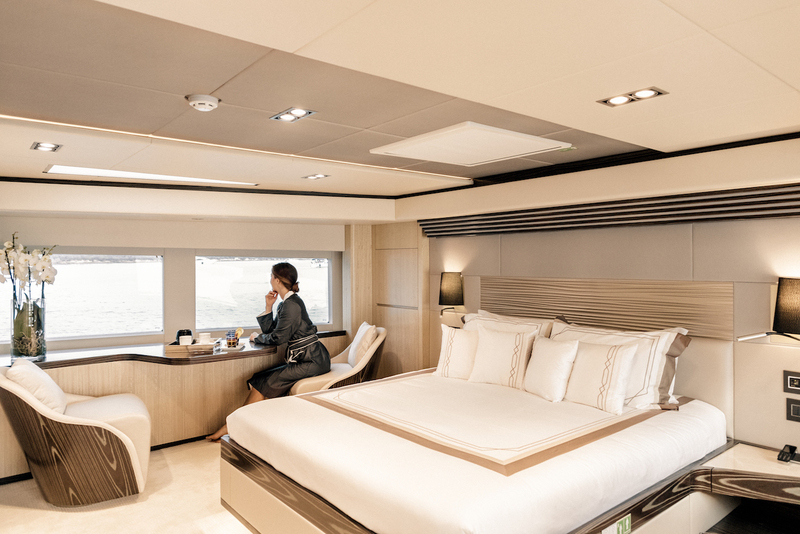 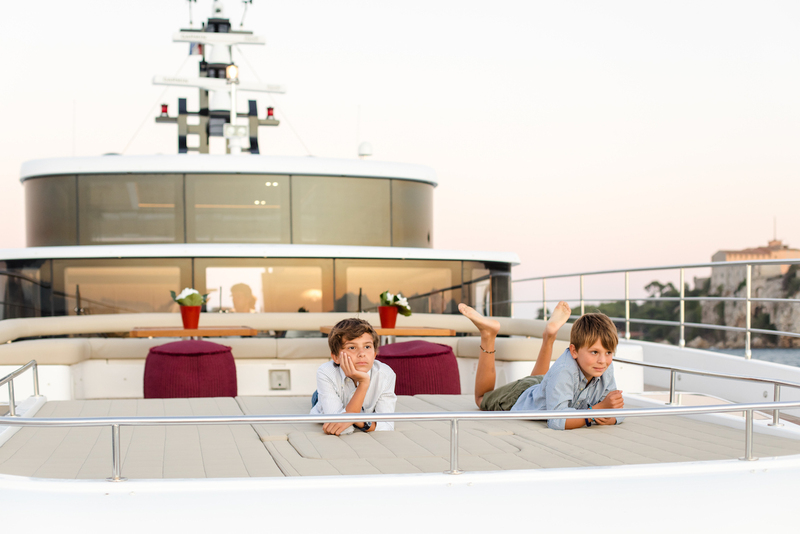 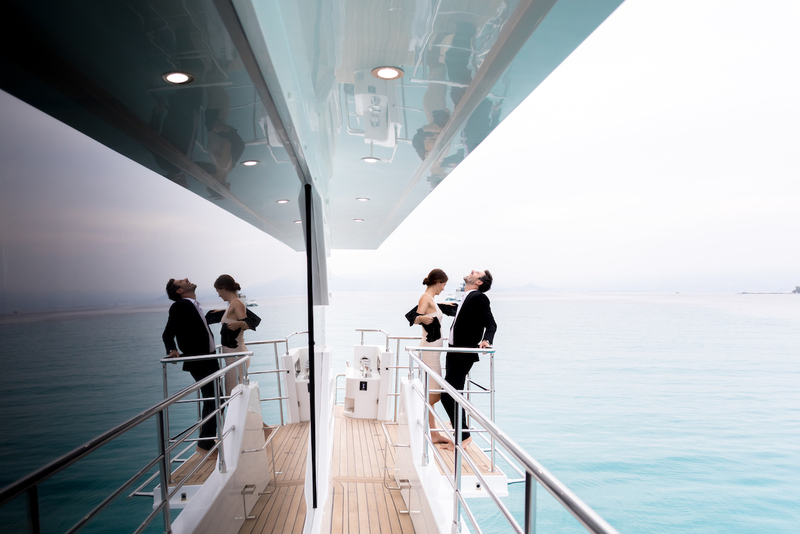 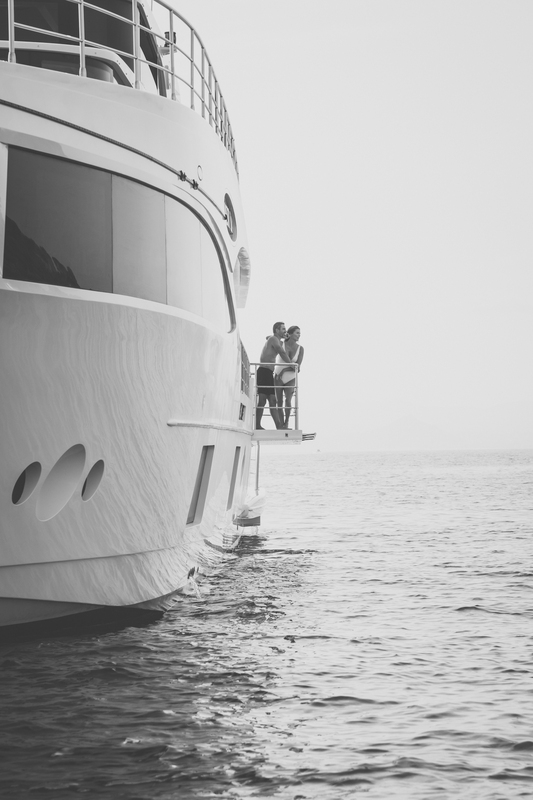 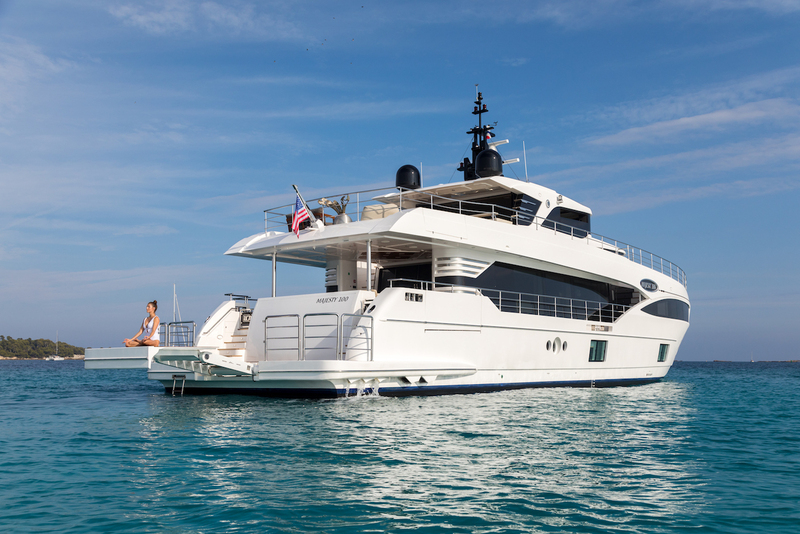 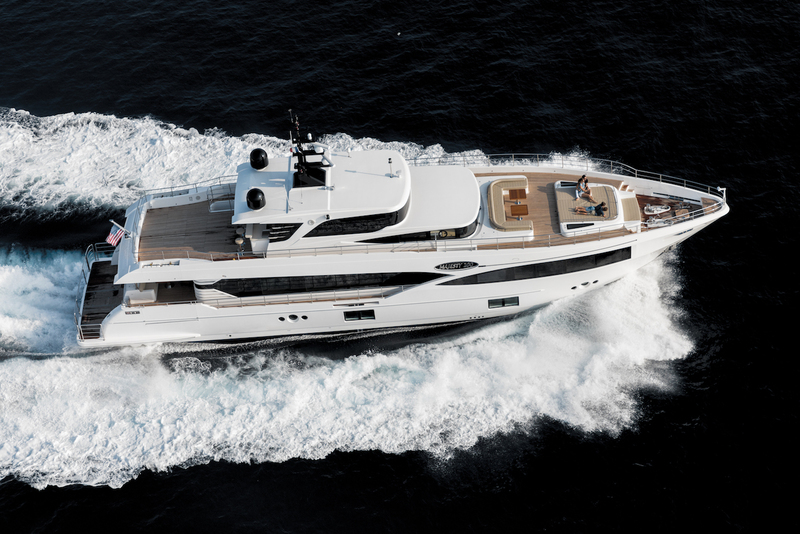 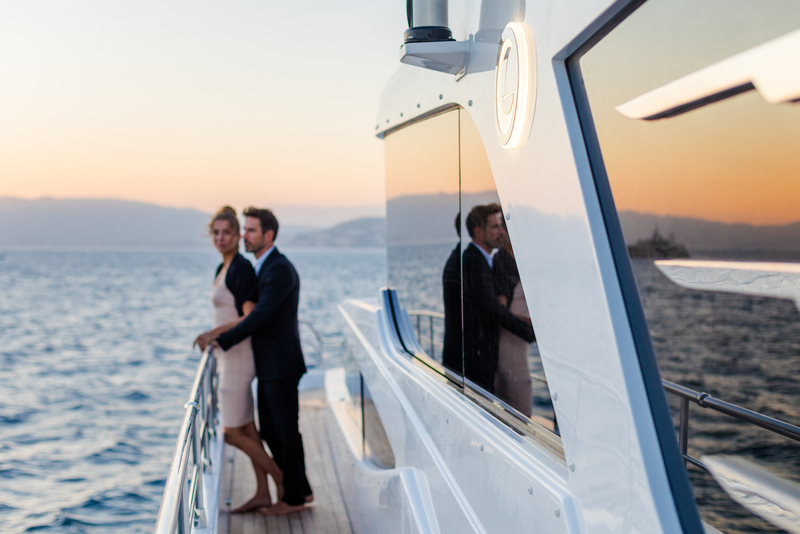 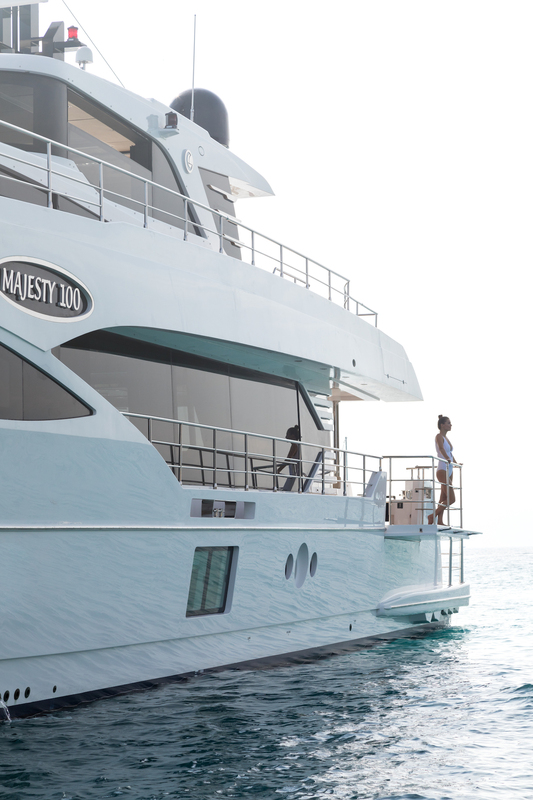 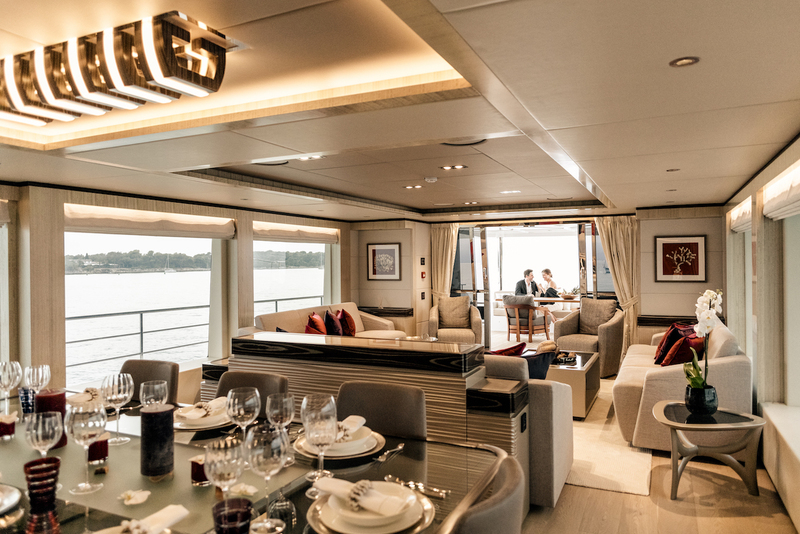 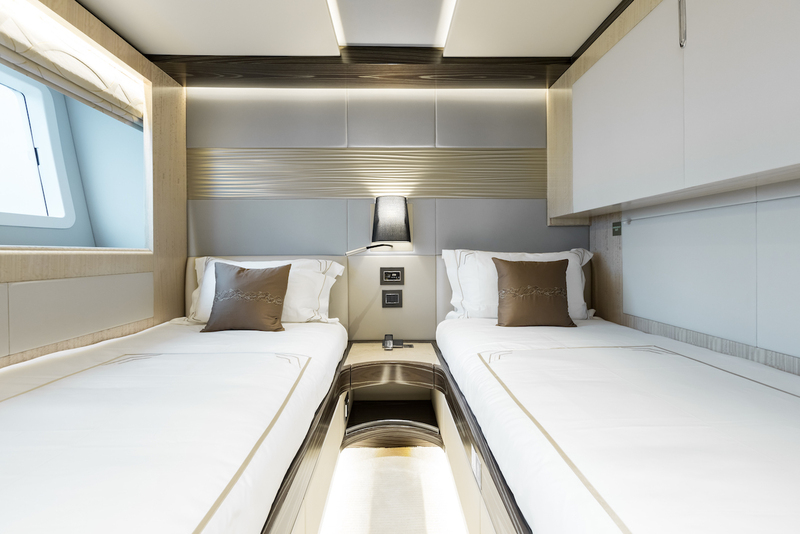 Twelve charter guests are offered spacious and comfortable accommodation in five guest cabins and one master suite. 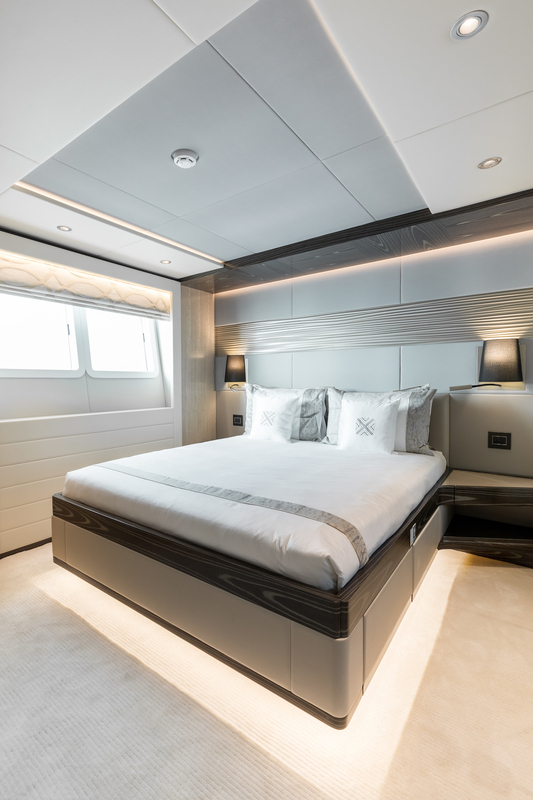 Her naval architecture, as well as interior and exterior design, are by Gulf Craft Design Studio. 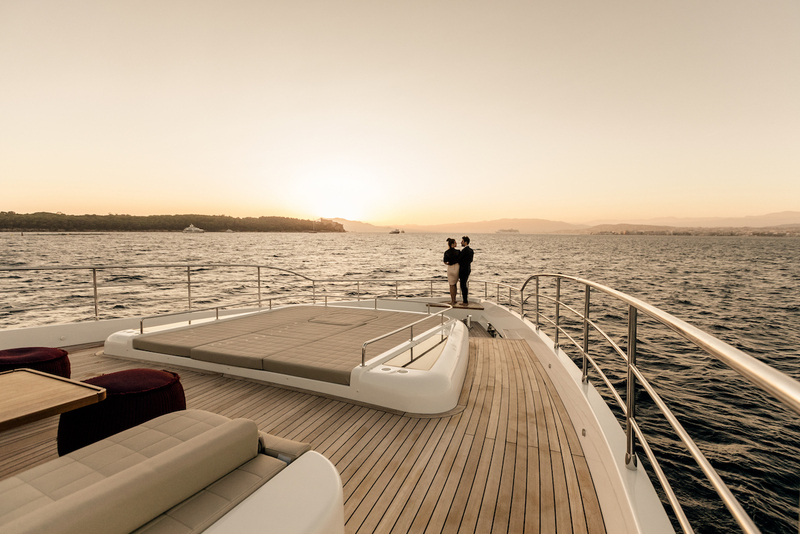 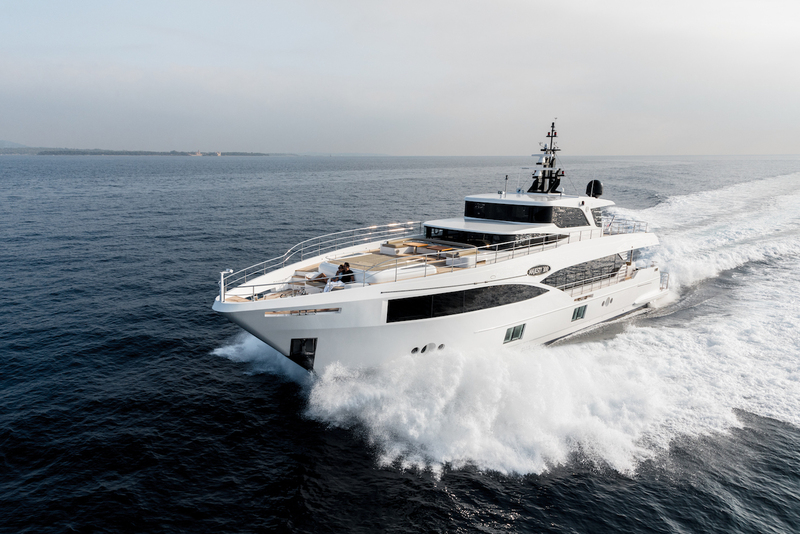 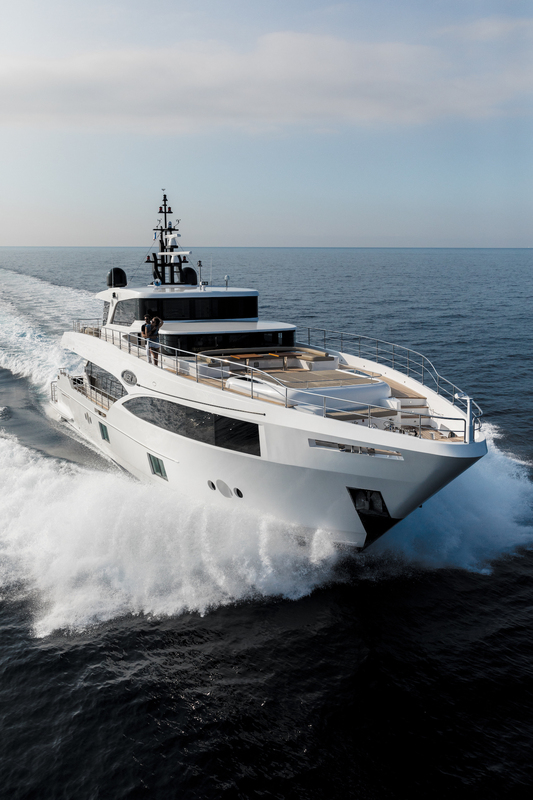 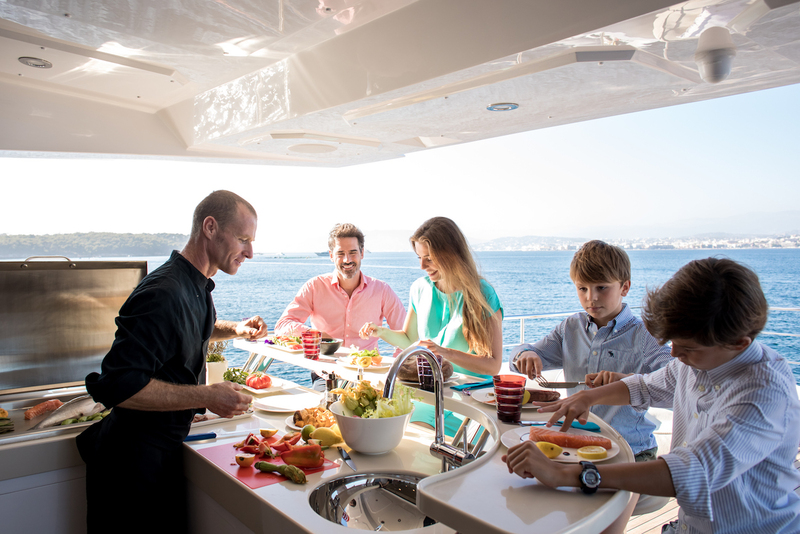 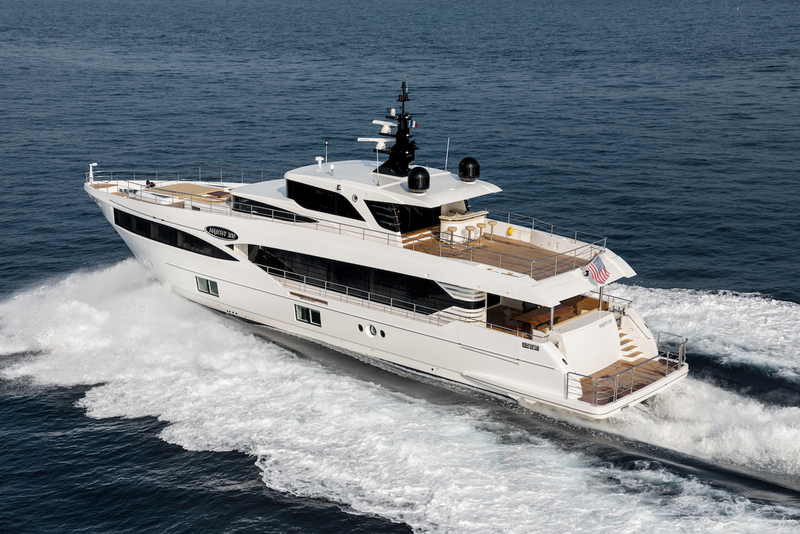 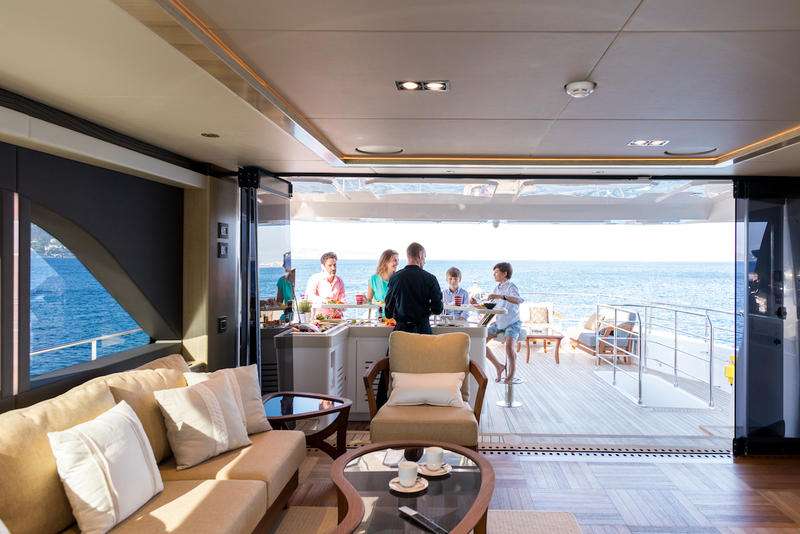 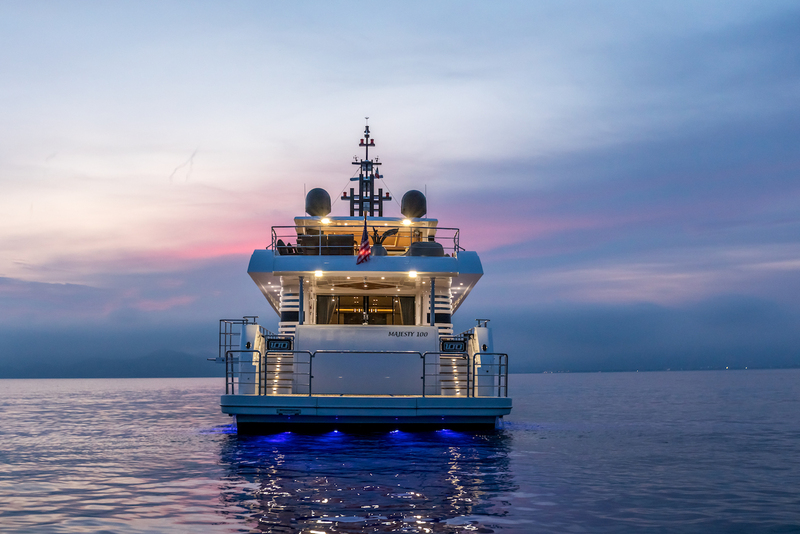 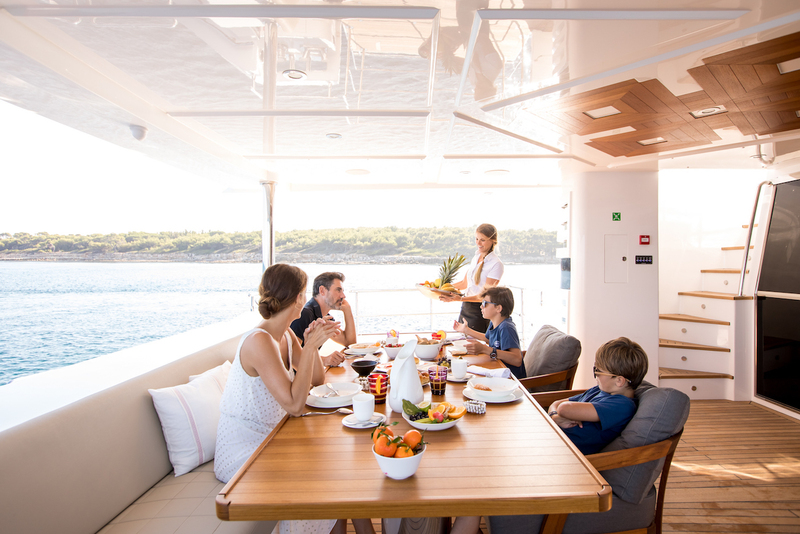 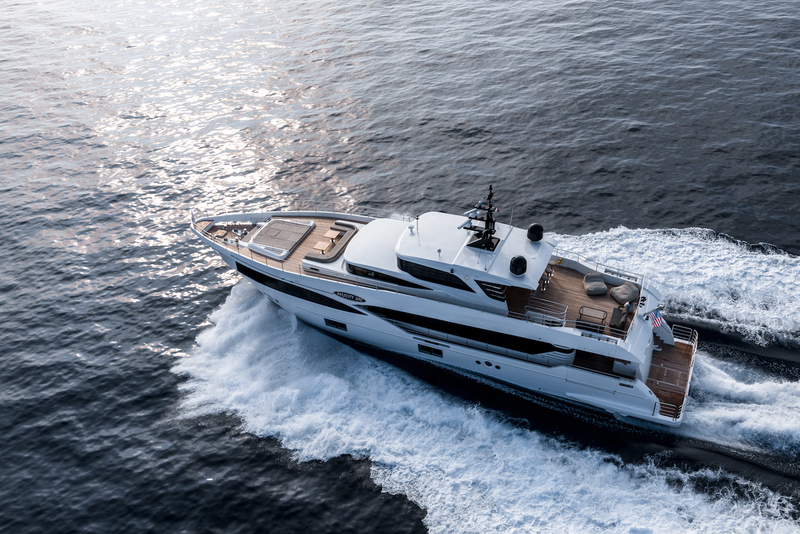 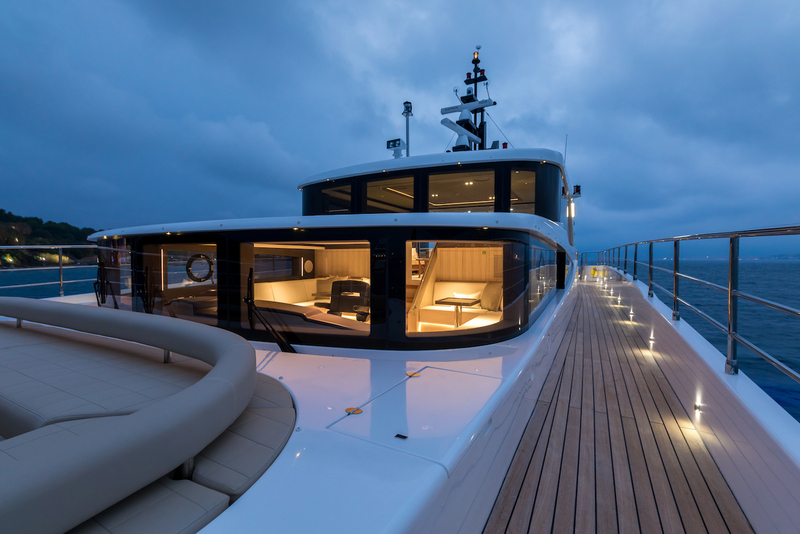 The main deck aft provides a shaded outdoor area for guests to dine in comfort, and a fold-out terrace on both sides increases the alfresco space available. 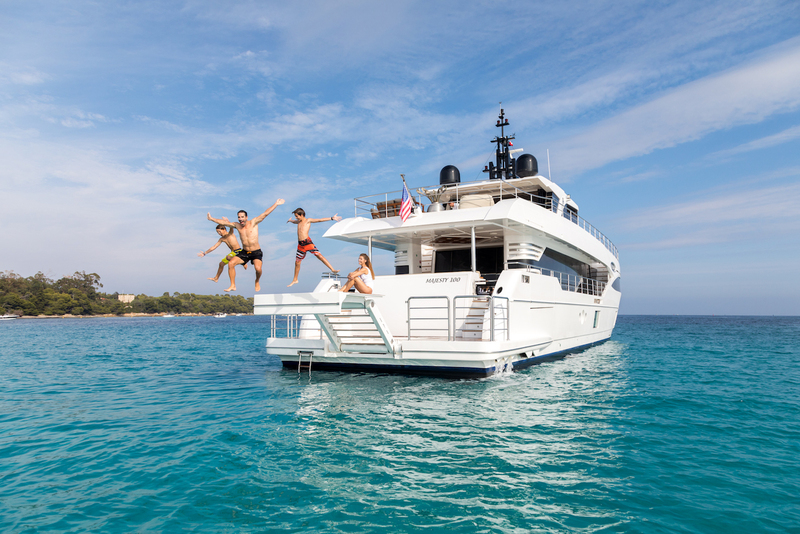 Wide stairs lead down to the swim platform where the large space is perfect for sunbathing and a retractable platform and steps grant easy access to the water for all ages. 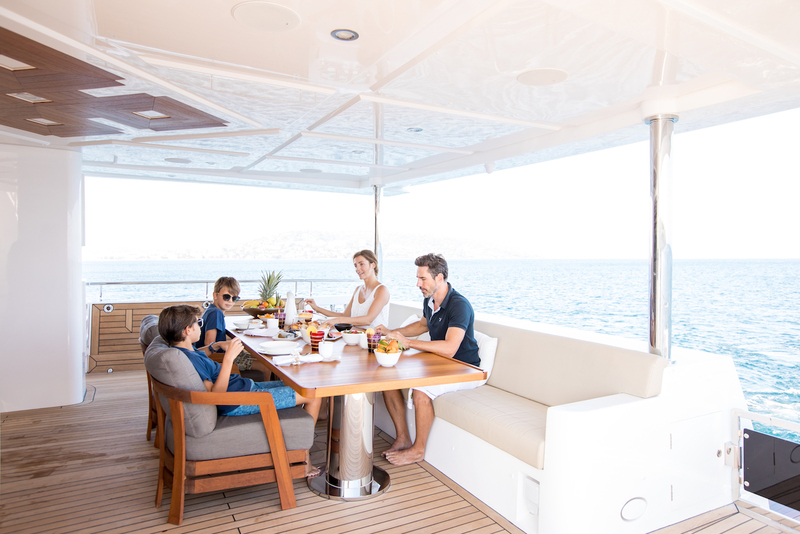 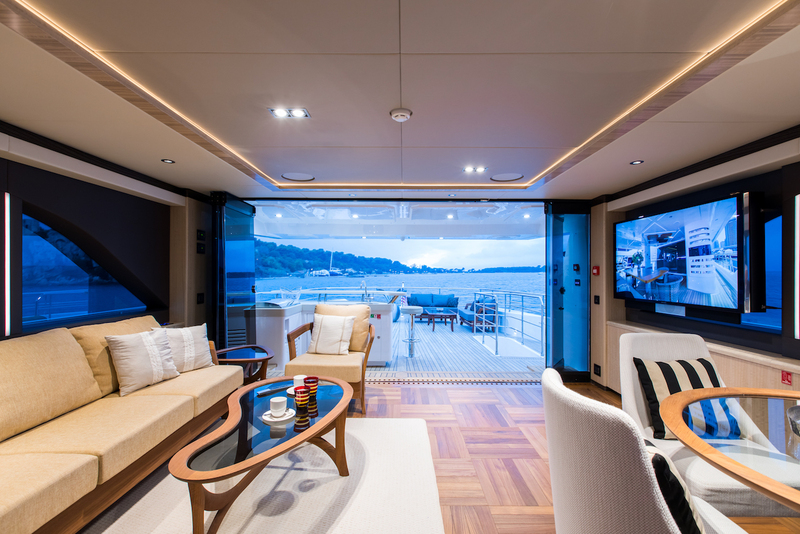 The upper deck aft is a comfortable and laid-back space with oversized seating placed around the edge and a coffee table to rest drinks from the wet bar under the shade. 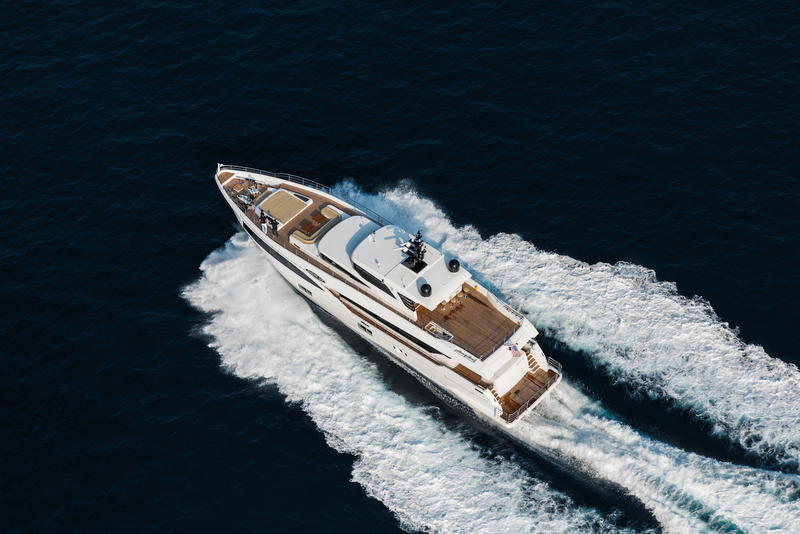 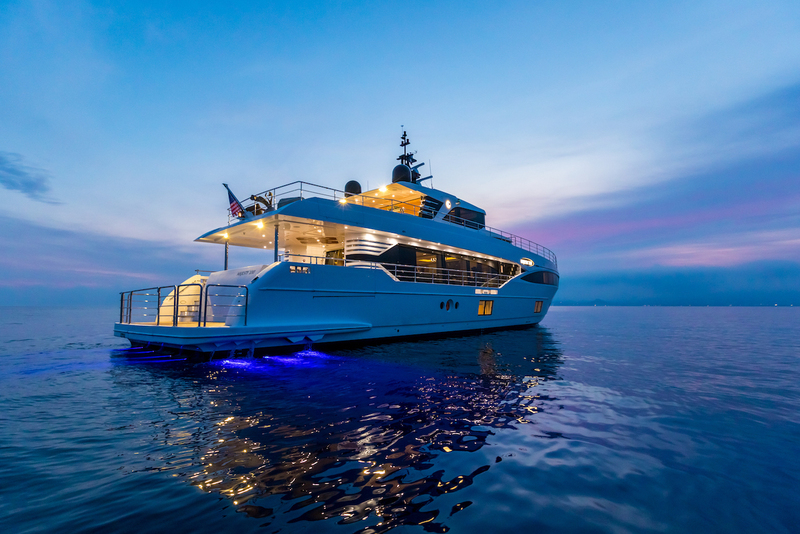 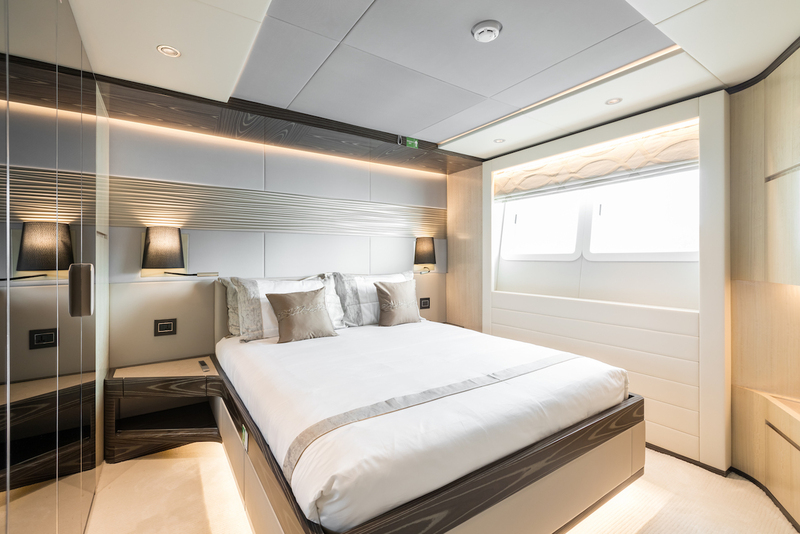 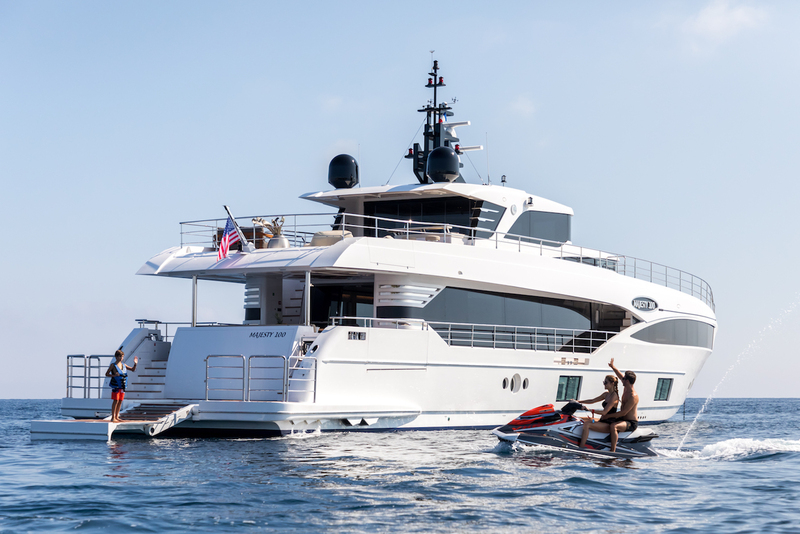 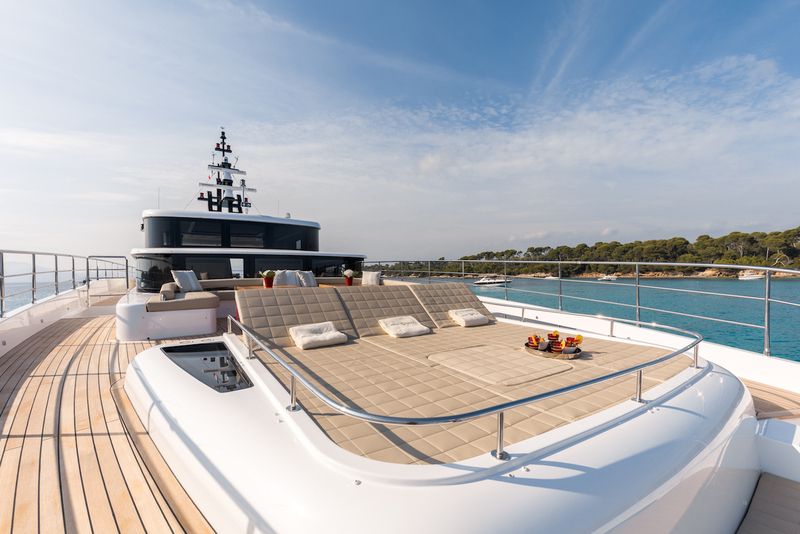 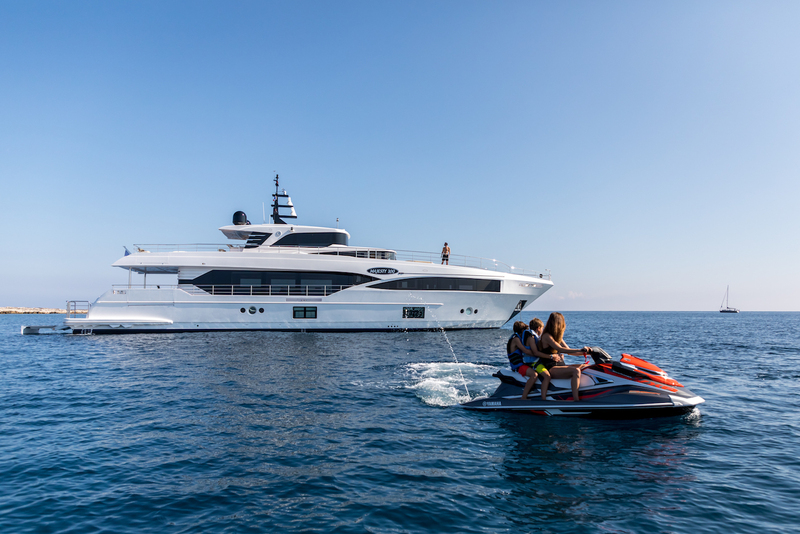 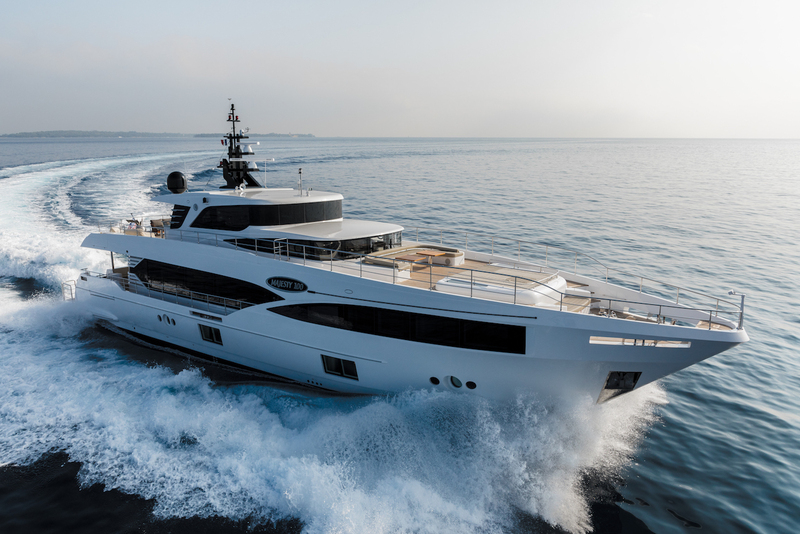 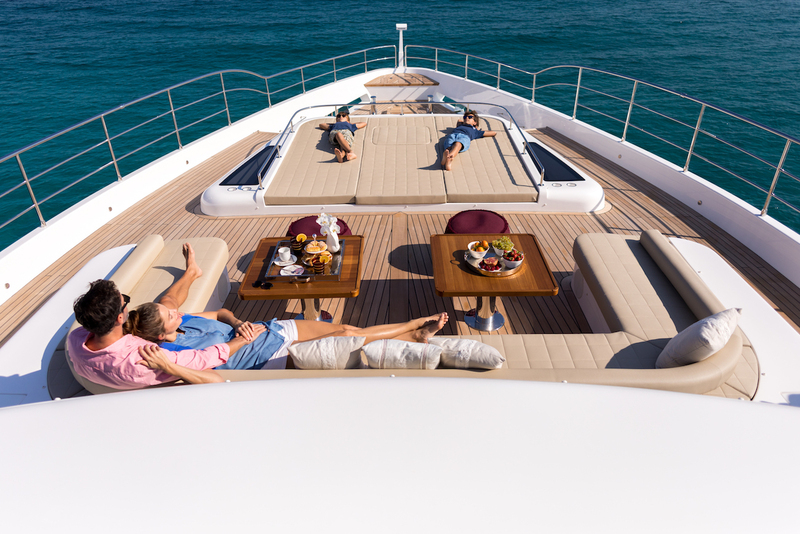 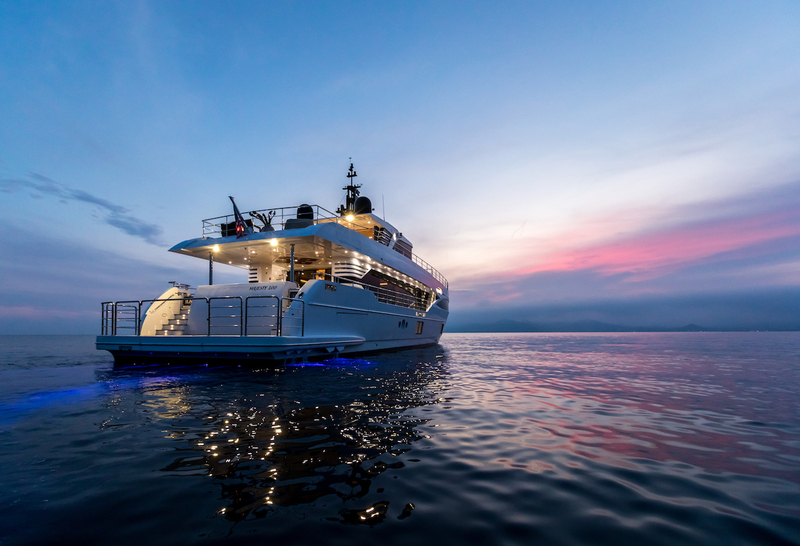 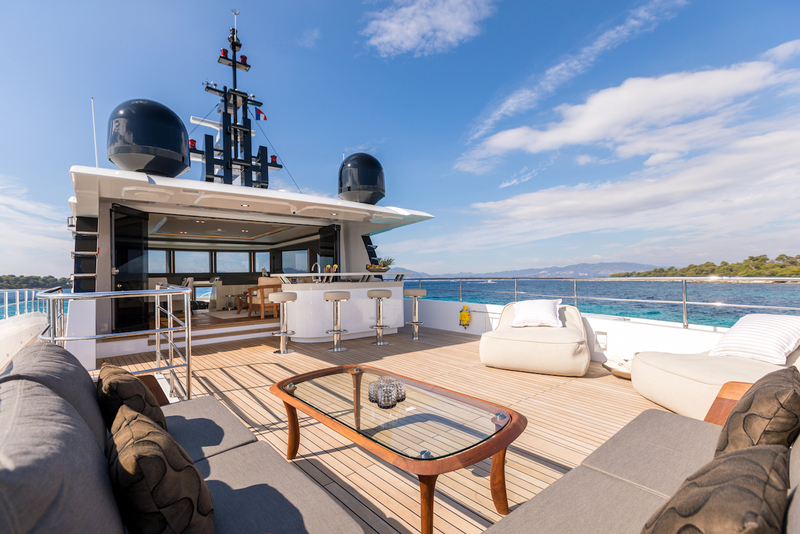 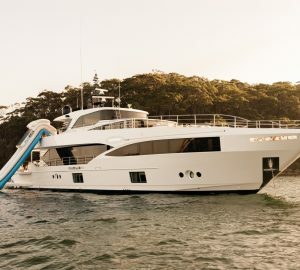 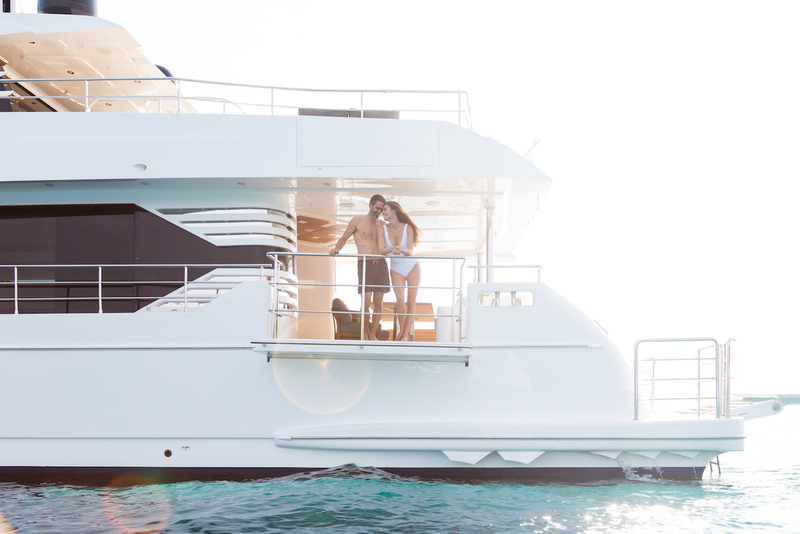 The foredeck is a magnificent sunbathing and socialising area usable at any time of the day with a C-shaped sofa and drinks tables under the helm station, a double-sized forward sunpad with a Jacuzzi concealed underneath and a love seat down the steps on the bow. 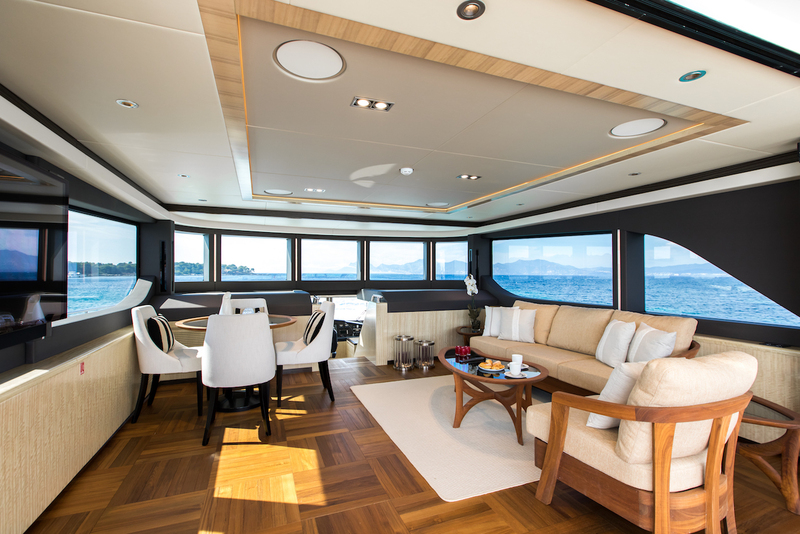 The interiors make use of large windows for excellent views and natural lighting throughout. 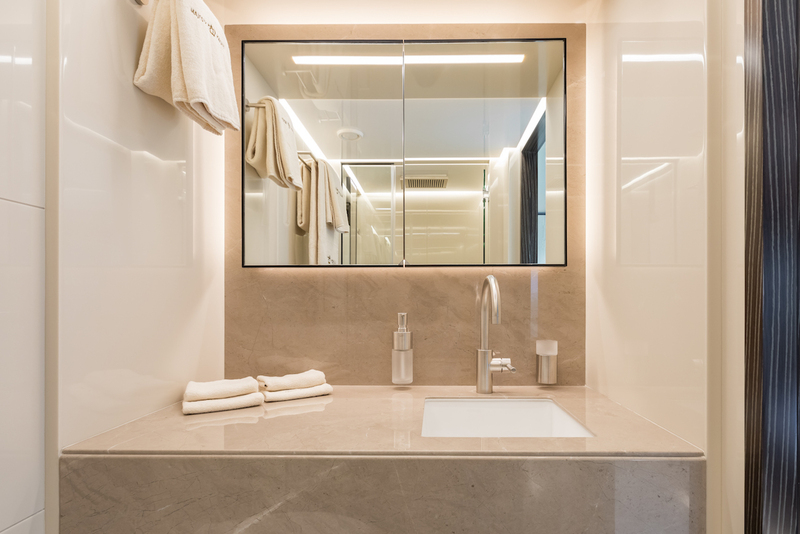 The contemporary colour scheme applies dark and light earthy tones to the surroundings as well as patterns and textures found in natural materials for warm and welcoming environments suited to any special occasion or casual family break. 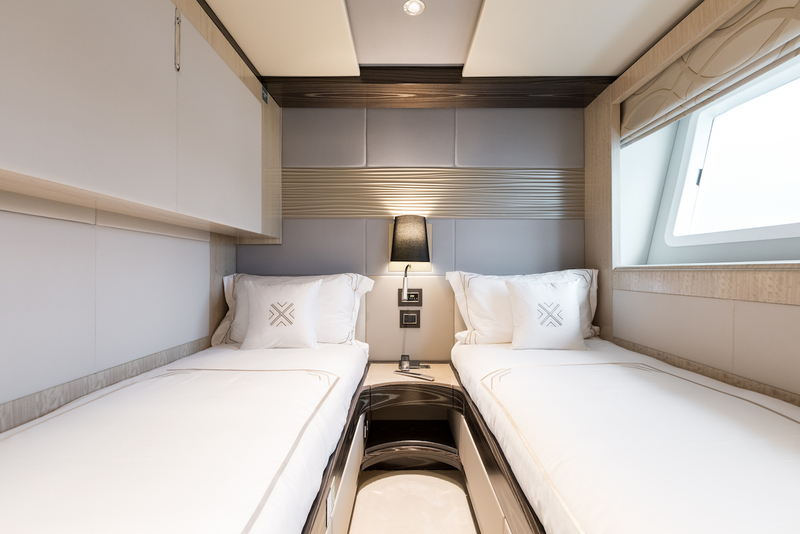 The lower deck hosts the majority of the guest accommodation and consists of two double cabins and two twin cabins with Pullman berths. 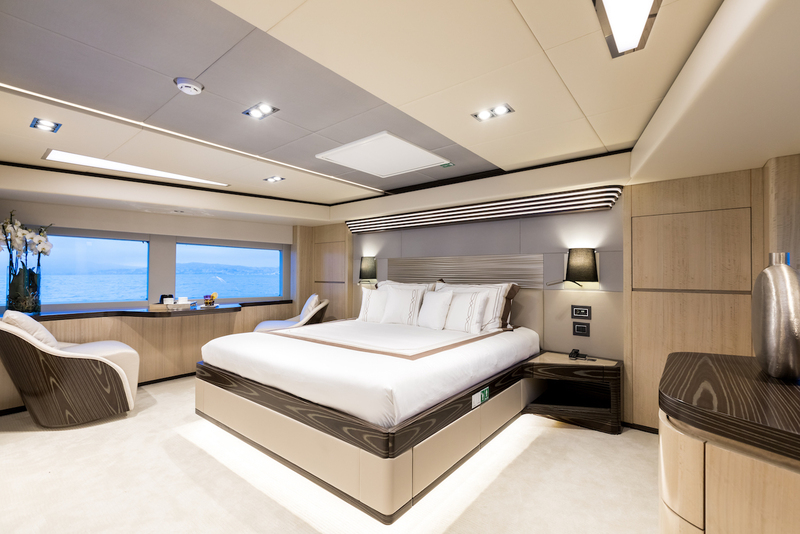 The Master suite is placed on the Main deck forward for greater privacy and increased natural light. 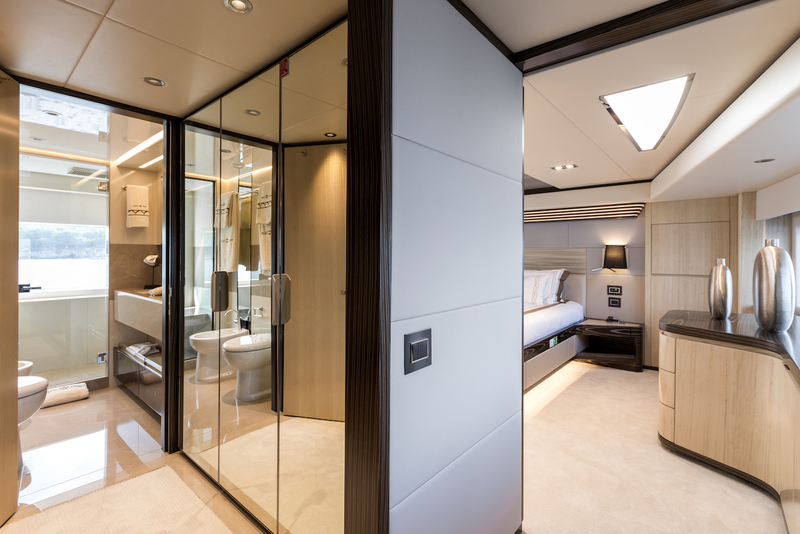 As well as a private seating area within the bedroom, there is an elegant bathroom with walk-in wardrobe, and the office ensures additional privacy between the Master suite and the main foyer. 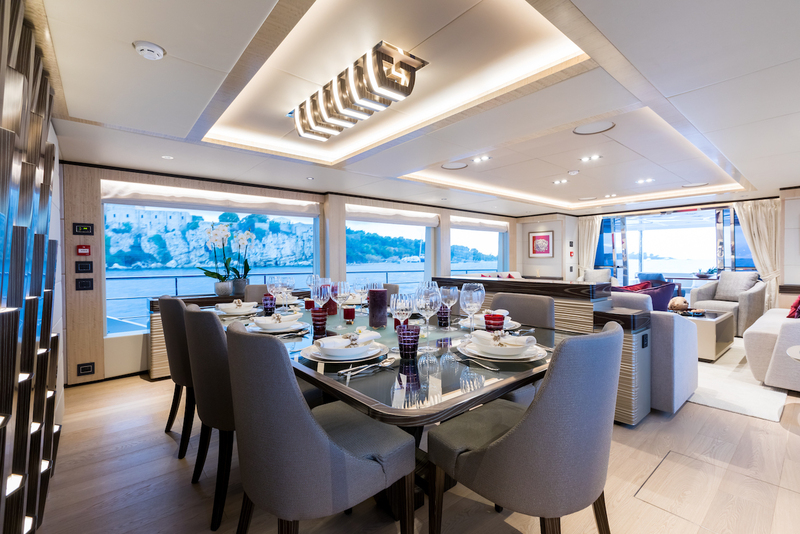 To the aft, there is a formal dining area to seat up to 10 guests to a lavish meal while the salon offers three sumptuous sofas and additional armchairs and coffee tables for the ideal setting to begin or wind down an action-packed day. 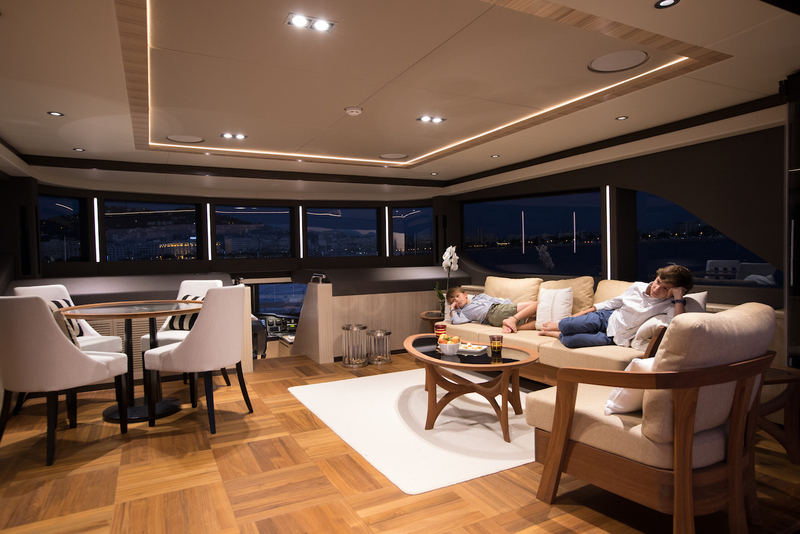 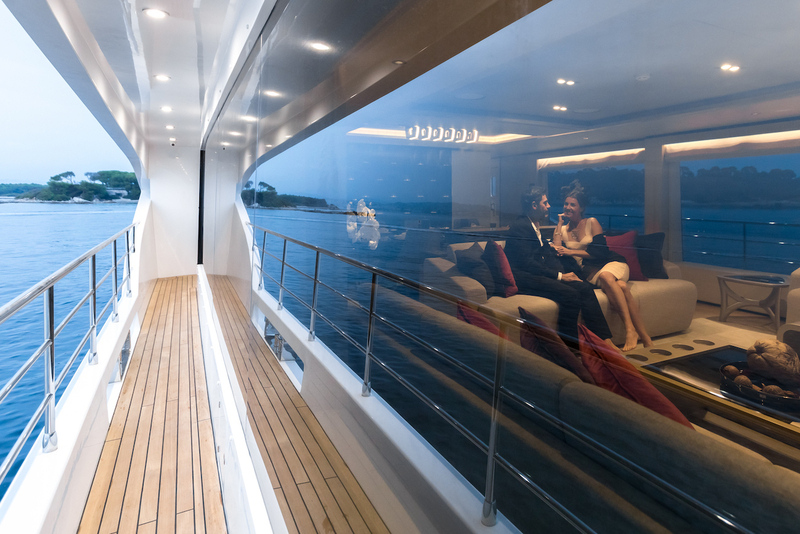 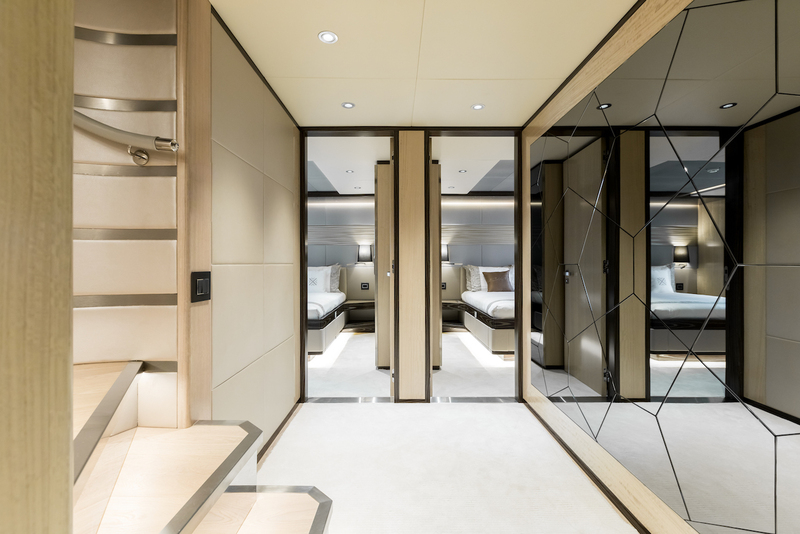 Most of the upper deck is dedicated to alfresco living, and the sky lounge therefore provides an intimate air-conditioned environment for conversation and games out of the sunshine. 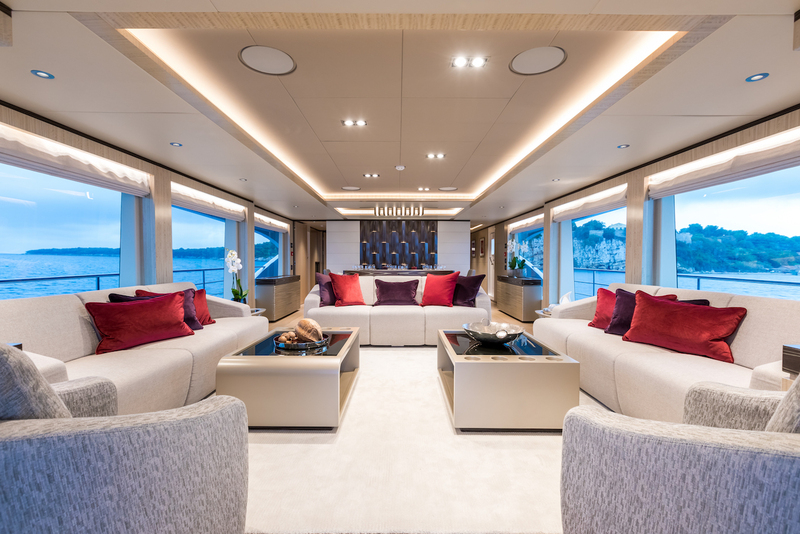 A settee and armchair with nearby drinks tables provide a place to unwind, while a circular table beside the windows has four chairs for drinks and games while taking in the magnificent scenery. 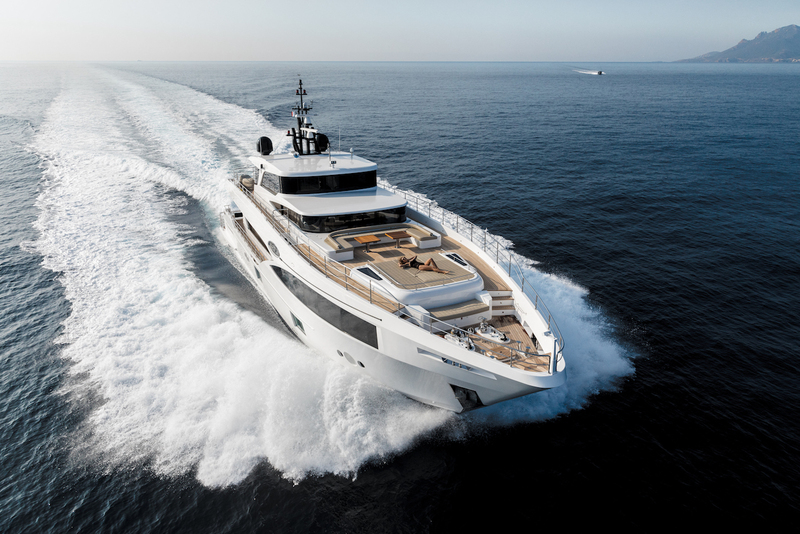 Twin MAN engines producing 1,550 HP each allow for a cruising speed of 14 knots and a top speed of 20 knots. 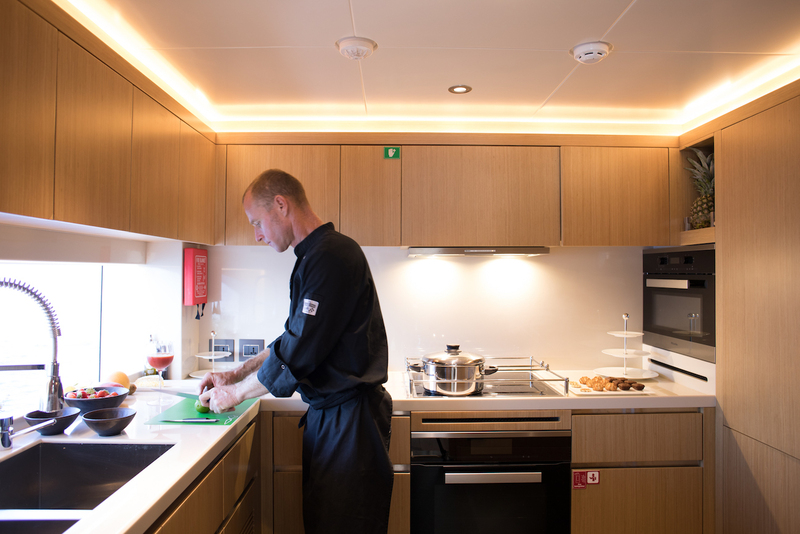 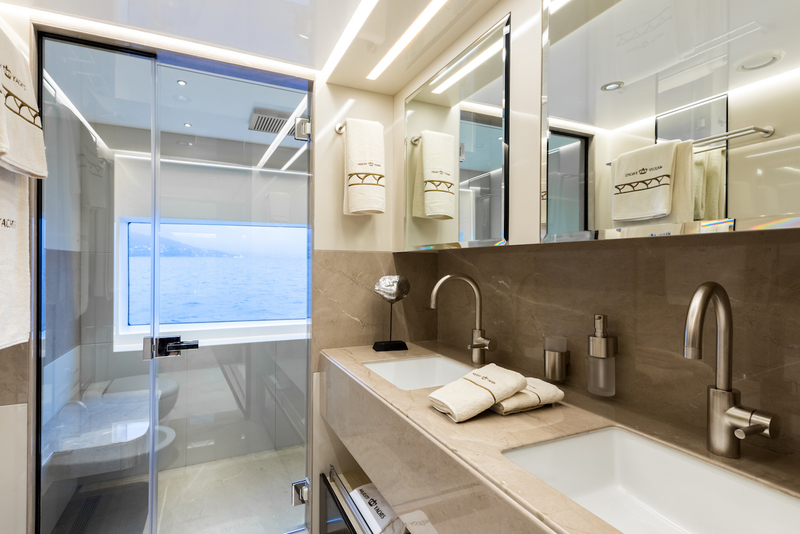 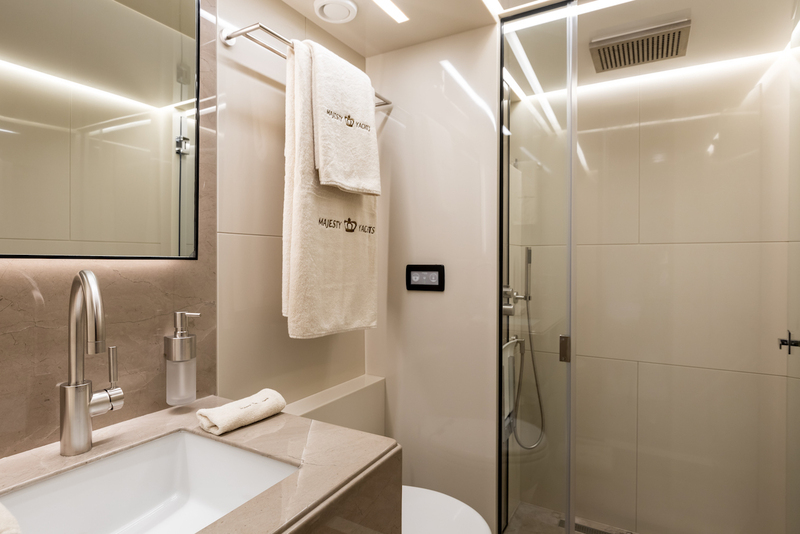 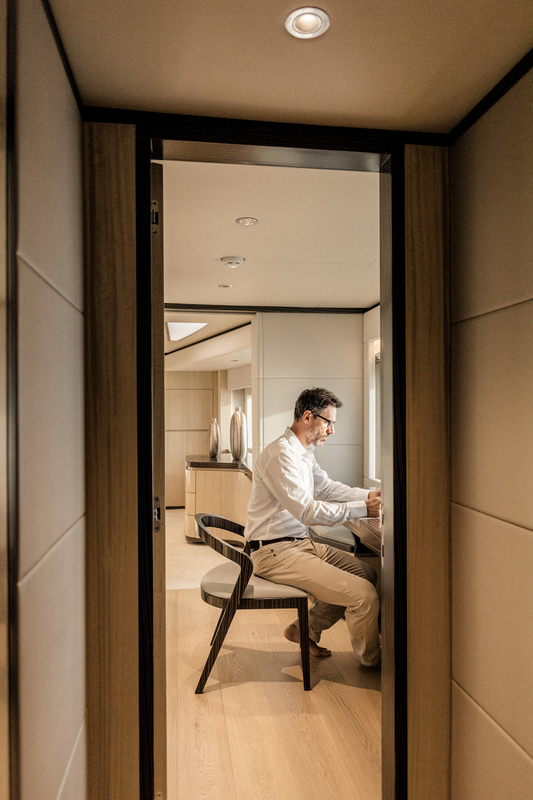 Twelve guests are accommodated across six large staterooms with ensuite bathroom facilities and luxury amenities.